Sporadic corticobasal syndrome (CBS) has been associated with diverse pathological substrates, but frontotemporal lobar degeneration with TDP-43 immunoreactive inclusions (FTLD-TDP) has only been linked to CBS among progranulin mutation carriers. 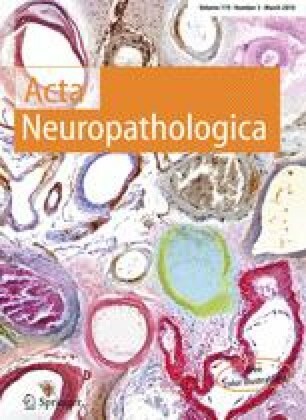 We report the clinical, neuropsychological, imaging, genetic, and neuropathological features of GS, a patient with sporadic corticobasal syndrome. Genetic testing revealed no mutations in the microtubule associated protein tau or progranulin (PGRN) genes, but GS proved homozygous for the T allele of the rs5848 PGRN variant. Autopsy showed ubiquitin and TDP-43 pathology most similar to a pattern previously associated with PGRN mutation carriers. These findings confirm that FTLD-TDP should be included in the pathological differential diagnosis for sporadic CBS. We thank Giovanni Coppola for assistance with the progranulin mRNA analysis. This study was supported by National Institute on Aging (NIA, grants P01 AG19724-01A1, P50 AG1657303-75271).